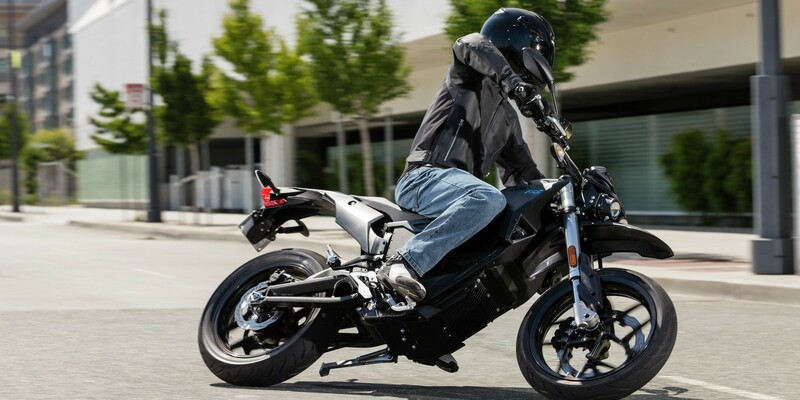 Zero Motorcycles, a maker of battery-powered motorcycles, is at the American International Motorcycle Expo in Orlando, Florida today to unveil its 2016 lineup and announce 2 new models. On top of the new models, the company is also presenting a new motor design, a faster charging infrastructure, a new lithium-ion cell chemistry for more capacity and efficiency, and it will lower the price on two base models while adding more features and performance throughout its lineup. The two new motorcycles are bringing Zero’s offering to six different models now ranging in price from $8,495 to $15,995. The first new model introduced is the Zero FXS (picture above), a supermoto made for city and track. It delivers 70 ft-lbs of torque, up to 44 hp and weighing less than 300 lbs. The bike is equipped with 17” wheels and Pirelli Diablo Rosso tires, advanced ABS, fully adjustable suspension and dual projector beam headlights. FXS will be Zero’s new entry-level offer starting at $8,495 for the version equipped with the 3.3 kWh battery pack, which allows for a city range of about 45 miles (72 km). A 6.5 kWh version with twice the range is also available for $10,990. Zero’s other new model is a performance bike called Zero DSR, an upgraded version of Zero’s DS. it delivers 56% more torque, 25% more power and accelerate from 0 to 60 mph in 3.9 seconds with 106 ft-lbs of torque. It’s not cheap. The DSR starts at $15,995 or $5,000 more than the DS. It gets 147 miles (237 km) of city range and 88 miles (142 km) of highway riding on 13 kWh battery pack. The optional 1.9 kWh ‘Power tank’ adds about 15% of range for $2,674. The 2016 models are equipped with Zero’s new Z-Force® powertrain, which uses an interior permanent magnet motor and a new battery pack with optimized lithium-ion cell technology. The new 2016 models will arrive at Zero’s authorized dealers in November 2015. The company also introduced a new charging accessory called ‘Charge Tank’, which will go on sales next year (February 2016) and will have a suggested retail price of $1,988. Charge Tank will enable level 2 charging for Zero’s lineup. It should recharge a Zero in two to three hours depending on the battery pack.